Sometimes it is the simple things that matter. I wonder how many folks are storing canned goods in their preps and forgetting that they usually rely on an electric can opener which will be unavailable in SHTF or Grid Down situations. But there is one simple, effective,cheap and highly versatile can opener available. I am talking about the eternal P-38 military can opener. The G.I’s friend for many years. Developed in 1942 for the military K and C rations, it was standard field ration issue until the 1980’s when the MRE (Meal Ready to Eat) came on board. No one knows exactly where the name P-38 came from, but the consensus is that it takes approximately 38 twists around a C ration can to open it. In the Marine Corps, it was often referred to as the “John Wayne”. The P-38 was joined later by a larger brother, the P-51. You can see the size difference in the picture below. The P-51 is still issued in larger field rations, the “Tray Rations” These are some of the handiest can openers you can have. My colleague Paul over at Thoughtfully Prepping says “Round my neck lives an extraordinary multitool the like of which is not often found. 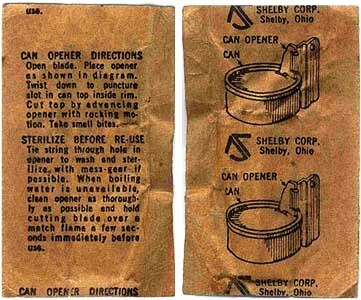 It’s an old style mil fold flat can opener. 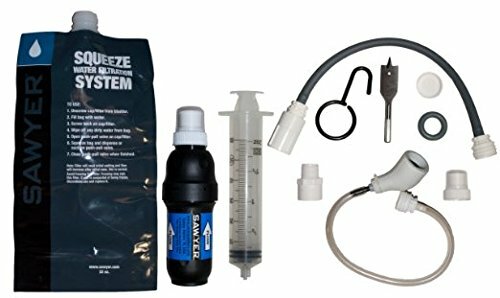 A simple thing which allows me to (surprisingly enough) open bottles and cans, gut animals, cut rope and cloth, sharpen sticks, undo screws, acts as a water drop magnifier, a trigger for snares, a hook to lift latches, a magnet by design, and a striker for flint.” The enterprising can discover many more uses. And they actually open cans very well! I keep a number of these stashed throughout my prepping gear and you should too. These items are ridiculously cheap. You can get P-38’s here,, or you can get P-51’s here. You can even get a combo pack of one of each here. They are a bit small for a spoon, but are better than your fingers and can open a bottle. Various armies have made, modified, or copied the P-38. So simple. So effective. You just gotta love em! If you liked this article and found it useful, please click the “Vote For Me” icon at the right of the page. Thanks!